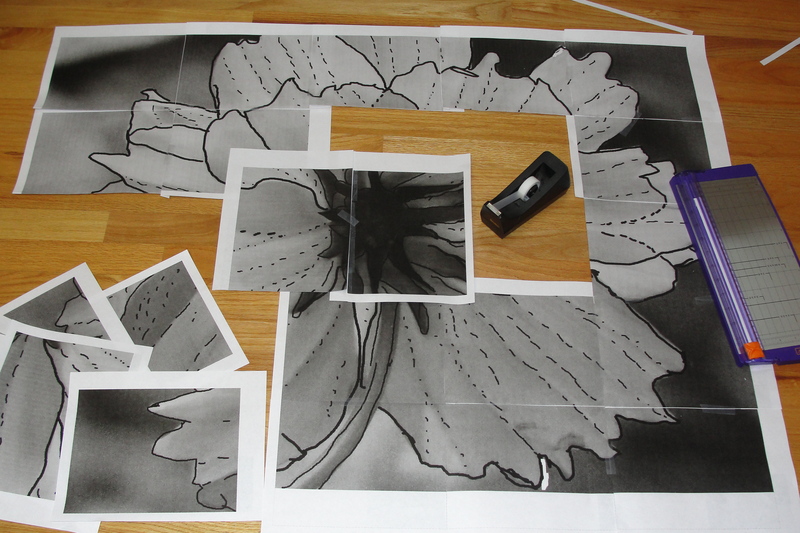 In the studio this week, several things were accomplished, including enlarging the pattern for the graphic flower. It is now ready to begin piecing and I am excited about the creative process. Using the printer’s poster setting, I was able to enlarge the pattern to about 44″x 32″, which will make a more dramatic piece! Several fabrics have been selected for this wall-hanging, though additional colors and textures will be chosen along the way…After reviewing different methods to transfer the pattern to fabric, I have decided to try an apparel design technique of using drafting paper to trace pattern pieces directly onto the fabric. A 1/4” seam allowance will be added as each piece is cut out. Another decision to make will be what type of applique method to use–raw-edge fused?, layered and glued?, or edge hand-turned and basted? Last week I received a gift in the mail–a beautiful piece of fabric–from someone who knows me very well! The piece is quite an inspiration with vivid, warm colors and a bold, graphic design. The panel is from the Dreamweavers series, designed by artist Stephanie Brandenburg and printed by Camelot Cottons. Visit Camelot Cottons’ website to read about this artist and view her work! Also, to learn more about her design process view the video, Meet Stephanie Brandenburg. This was a good week in the studio and next week it will be great to continue the creative process! Hooray for the gift of that amazing fabric and for your printer’s poster setting. Wonderful to know you are enjoying your creations and working well. Thanks granbee…it was a very nice surprise. LnddMiles – Pretty cool post. I just stumbled upon your blog and watend to saythat I have really liked reading your blog posts. AnywayI’ll be subscribing to your blog and I hope you post again soon! Can’t wait to see the finished project. It looks beautiful!!!! I always love seeing works in progress and the chance to learn something about other artists’ processes and approaches to work. Thank you!